First his slippered feet, then his torso, emerge as he shuffles down the single flight of stairs to unlock the main door to his apartment building. Later it becomes clear why he wouldn’t buzz in someone he has only spoken with over the phone; at 79, Bruce Polmanter has seen a few things, and prepares himself accordingly. The men in his family were all employees of the Canadian National Railway, working out of Belleville, Ontario. His father and grandfather lost limbs on the trains, but never elaborated beyond that, in the style of men of that time. Bruce was hired by CN when he was 14-years-old because of his brothers’ good reputation with the company. 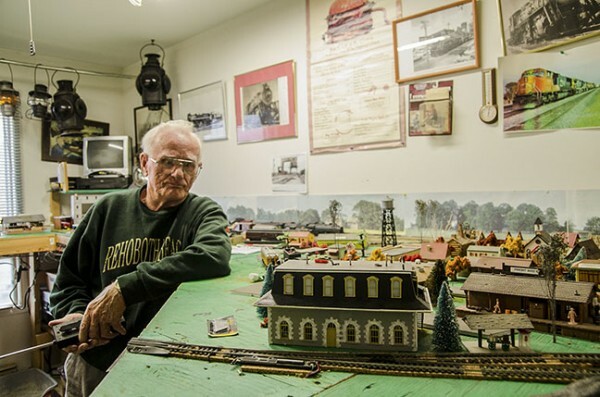 His bedroom and living room walls are lined with ceiling-high shelves stuffed with binders he put together on Belleville’s history, and stacks of cardboard tubes containing over a hundred maps of the railroad. When someone can’t find what they’re looking for at the local archives, the librarian often sends them to Bruce. His bed seems an afterthought, dwarfed by his collection of hundreds of books and records.He sleeps only between the hours of 11:00pm and 3:00am, vaguely attributing this to things he witnessed on the job, and other tragedies he chooses not to dwell on. The second room in his busy but tidy apartment is dedicated to his model trains and miniature figurines, set up in a U-shape, scarcely leaving room for the conductor. 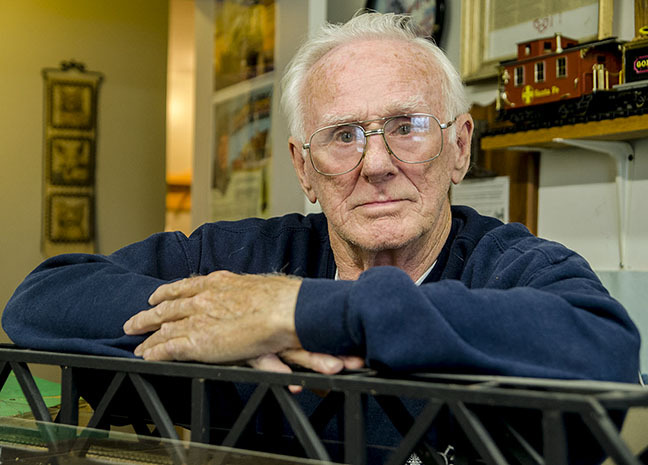 The walls are covered with paraphernalia: pictures of steamers – his favourite, an unopened toy boxer, a tiny replica of a vintage phone that he crafted, and a handwritten record of his ten-year employment on the Belleville railway. Because he cut his career as a brakeman and dispatcher short, he bemoans the healthy pension he forfeited. Then in the next breath he reneges, recalling what he witnessed and soberly comparing it with the gore seen by soldiers overseas. His short-term memory is beginning to wane, but having lived in Belleville is whole life, Bruce can rhyme off names of people and facts about places as effortlessly as he recalls the car numbers of every train he ever worked on. He is proud of the key he holds to this town, and that people know where to go to find it. This entry was posted in Multimedia and tagged Belleville, Bruce Polmanter, CN, CNR, Model trains, Railroad, Railway. Bookmark the permalink.